LLS Community : Is Your Food Safe? Food safety is a valuable goal year-round but especially in the warmer months. Why? More people travel and transport food during the vacation months. The outside temperatures in summer and early autumn often leave outdoor food in the danger zone, between 40 degrees and 140 degrees. Food eaten at outdoor events like picnics, tailgates, and cookouts are at a higher risk for foodborne illness if basic food safety rules are not followed. According to the U.S. Food and Drug Administration (FDA), one in six Americans get sick from foodborne illness each year. A food-related illness from spoiled or contaminated food can be life-threatening for a cancer survivor whose immune system may be compromised. 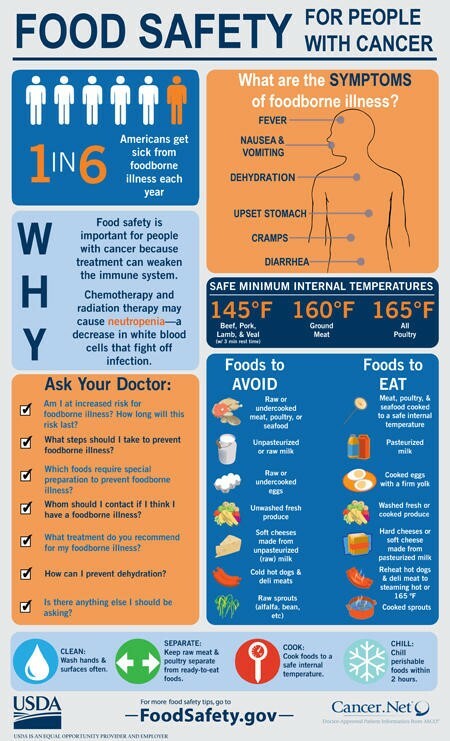 Food borne illness for cancer patients is not just a “tummy bug” or a “touch of the fever,” it could mean much more. September is National Food Safety Education Month. Take this Food Safety Quiz to see if you are as smart as a food scientist when it comes to food safety. Are the following statements true or false? Smoothies and honey at food trucks and fruit bars are safe to enjoy. False - Although smoothies and honey are often viewed as healthy foods, they may be unpasteurized at food trucks and other commercial eateries. Unpasteurized ingredients are at a higher risk for foodborne bacteria. It is safer to buy your own ingredients that say pasteurized on the label to make your cool beverages at home. You can clean fruits and vegetables under running water, no special produce soaps required. True - A thorough cleaning of fruits and vegetables, even ones labeled organic, under running water before cutting will clean these items. No special bleaches, rinses, or wash products are needed. In fact, some cancer survivors who have an increased sensitivity to detergents and chemicals have reported possible reactions to the cleaning agents sold as produce cleaners or washes. You can tell if meat is cooked by looking at a slice. False - You can’t tell if meat is cooked just by the appearance of the meat. Any cooked, uncured meat can be pink, even if the meat has reached the safe internal temperature. Instead of your eyesight, a meat thermometer is the best tool to use. By using a thermometer and a chart of recommended temperatures, you can be assured that your meat, poultry, or fish is cooked to a safe temperature. According to new FDA recommendations, you should allow fresh beef, veal, lamb, pork, and ham to rest for three minutes after removing the meat from the grill before testing the temp. Learn more about safe minimum cooking temperatures from the FDA. Alfalfa sprouts and sushi are healthy foods, and they great for me to eat during treatment. False - Some foods are more susceptible to bacteria such as E. coli, Salmonella, and Listeria—just to name a few. It’s best to avoid these high-risk food items until you finish treatment. Other foods to avoid include: raw sprouts, cold hot dogs and deli lunch meats (cold cuts), smoked fish, refrigerated pate, sushi, sashimi, unpasteurized beverages (raw milk and yogurt), unpasteurized fruit juices, and soft cheeses made from unpasteurized milk like Brie, feta, goat cheese, and queso fresco or blanco. Washing meat before cooking helps prevent food borne illness. The most important thing you can do to prevent illness is to wash your hands. True - You should wash your hands in warm, soapy water for at least 20 seconds many times throughout the day. (Singing Happy Birthday once is about 20 seconds.) Include rubbing friction like wringing your hands during the wash. When should you wash your hands? Wash before and after handling food, after using the bathroom, handling pets, or changing a diaper, and before taking medication. Marinate and defrost meats in the kitchen sink to prevent cross contamination. False - Marinate and defrost meats in the refrigerator. If you leave meat out on the kitchen counter or in the sink, it will quickly reach the hazard temperature zone of above 40 degrees, encouraging the growth of bacteria. Cross-contamination of cooking services can also occur in the kitchen sink or on the counter. For more tips on food safety during cancer treatment, visit My PearlPoint and www.LLS.org/nutrition.